Home » Unlabelled » Have I been robbed? For those who have been regularly reading my blog, you know how much I love all those food escapades with my friends. 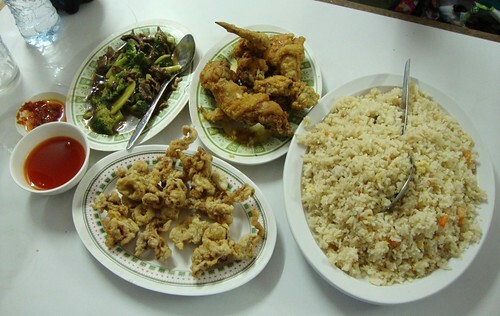 One of our favorite destinations is Estero in Binondo. I blogged about the place twice. You can find those posts here. Did someone just steal my picture? I checked the site that apparently used my photo without permission or even an acknowledgement. The site as it appears is hosted by The BigNM and Links2Prosperity. I don't really mind if other people grab and use my pictures without permission. I am likewise not familiar with copyright laws so I don't even know if my blog is legally protected from such misuse. I admit, I also grab pictures from other blogs and websites. However, I don't claim ownership for the pictures. In effect, I link each source as my way of showing respect to the real owner. My only request to those people who intend to use any of my photos is to identify my blog as the original source. I don't mean to be selfish here. A little respect in the form of acknowledgement would be enough. Oh, this is so sad. I really hope they acknowledge that the picture is yours at some point. I hate when this kind of things happen, it's a matter of respect to link back to the source. that is just rude! did you contact them? Did you contact the administrator about it? I think this is becoming common here in our country because copyright laws are not being strictly implemented and stuff like these are hard to monitor.